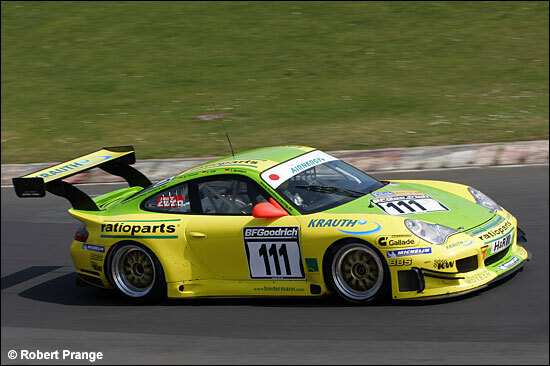 Manthey Racing controlled this week’s German Endurance Championship race from the start almost to the finish, then lost the win, then got it back again. 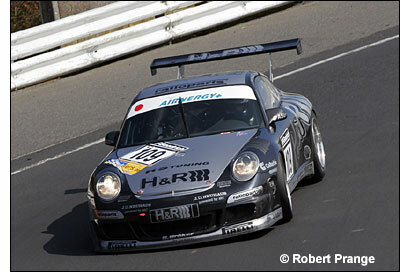 From pole position, the Porsche 996 GT3 MR Special led the race until about ninety seconds from the end of the scheduled four hour duration. By this stage, there was nothing to be seen of most serious competitors: Peter and Christian Mamerow had to abandon their 996 very early on after a collision, and the Land Motorsport team of Marc Basseng and Patrick Simon were put out of the race by “collateral damage” from a tyre failure. With this, the fight for second place was practically over, Jürgen Alzen and the one and only Klaus Ludwig holding station without really being able to mount a serious challenge for the lead, their 997, right, not handling well with a full load of fuel on board. Porsche works drivers Timo Bernhard and Lucas Luhr again shared the Manthey car with Marcel Tiemann who, after a faultless performance by car and drivers, had just started the 28th and last lap of the race when to his, his team’s and the 28000 spectators’ astonishment, a tyre let go on the Porsche at the end of the main straight. Tiemann reached the pits via the Grand Prix track “shortcut” but the win was gone. 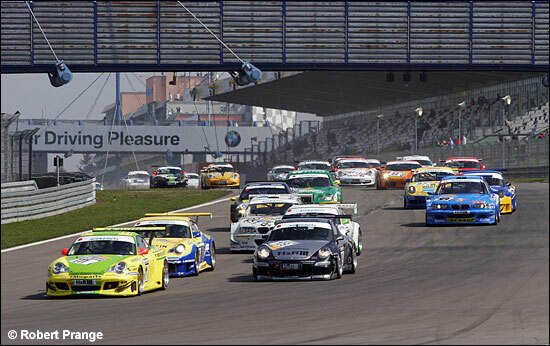 Then race control was notified of oil on the racing line at the Breidscheid section of the Nordschleife, and stopped the race some 94 seconds early. 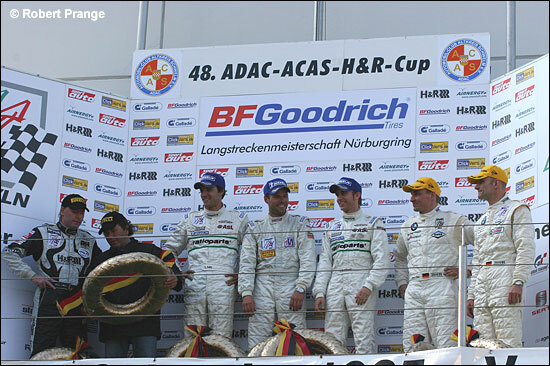 The result as of lap 27 was declared official, and the sigh of relief from the Manthey team could be heard in Belgium. The grids keep growing: 195 cars started the race, 138 of these reached the finish; but only four were on the lead lap. Veteran VLN competitors Tobias Hagenmeyer, president of gearbox manufacturer Getrag, and his long-time team mate Michael Bäder were best non-Porsche of the weekend in their BMV M3 Special, trailing the winners by almost four minutes. Another six minutes back, the Schalls showed that their DTM Opel has completely recovered from its crash two weeks ago. But with two victories from two races, both with tyre trouble at the finish, Bernhard, Luhr and Tiemann now now have at least a month to savour their overall lead in the German Championship points table, until the next race on May 20. With thanks, as always, to our friends ‘Ringside, and photographer Robert Prange.